Digital technology presents a great challenge for printing companies and manufacturers of printing machines. In the face of an increasingly dynamic media world and ever higher demands for customization in packaging printing, the ability to change formats quickly is crucial. At the same time, productivity must be increased and paper waste reduced. The most innovative solutions for the printing industry start with Bosch Rexroth, the worldwide market leader for the automation of printing and converting processes. In the 90s, Bosch Rexroth developed the world's first electronic line shaft for printing machines, as well as the world's first drive-integrated safety system. To date, the company has installed more than 100,000 motion control systems with over 1,000,000 servo drives in printing and packaging machines. 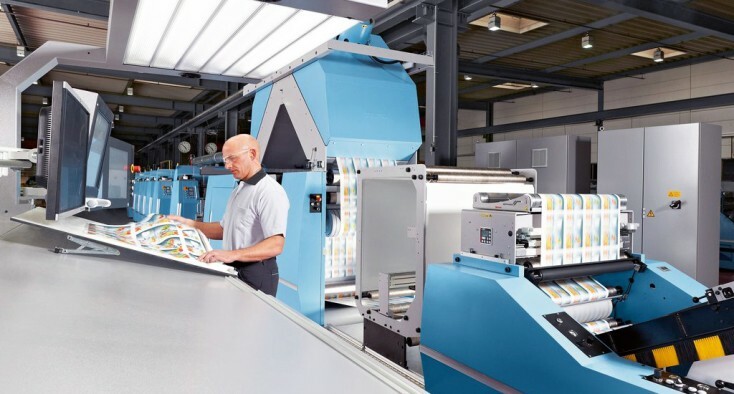 The Rexroth automation system offers consistently scalable, reliable and flexible solutions for all printing products. The control system, with integrated register control and numerous process control functions, reduces paper waste, allows for higher printing speeds and ensures utmost accuracy. The cross-system safety technology guarantees maximum performance at minimum expenditure. This allows OEMs to simplify their engineering and save on hardware costs. Rexroth hardware has been available around the globe for over 25 years-- an important contribution to investment security. For older systems, Rexroth plans and implements retrofit and modernization measures. The newly developed automatic state-dependent monitoring system is complemented by Rexroth's comprehensive service package for printing machines. It uses the existing data from the printing machine's drive and control system. The tool analyzes trends and changes for a variety of process parameters and generates instructions regarding current maintenance requirements. As a result, machines will have a longer service life. With its pioneering solutions Rexroth is the market leader in motion control, linear motion technology and fluid technology across all industries. We can advise clients about different technologies and offer complete automation solutions from one single source. This is an important consideration, as printing machines use not only electric drives and controls but also linear motion technology as well as pneumatic and hydraulic systems.